Our last weekend in Las Vegas was hectic with packing for four, stopping by at the 99 cent store (my son’s favorite) and helping my sister’s do errands. 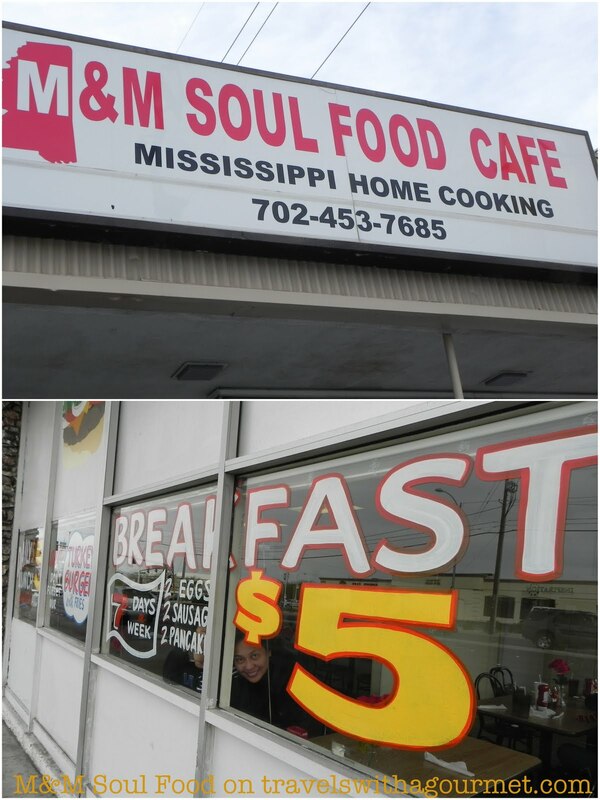 On Saturday, after an early breakfast at home, we went for a late brunch at M&M Soul Food. Although the place is a bit of a dive (kind of like a rundown diner), it looked promising as the place was pretty full. We took the last table in the back that was big enough for all of us (four adults and two kids). We just missed the breakfast menu which is served until 1 p.m. so we proceeded to order from the larger lunch menu. 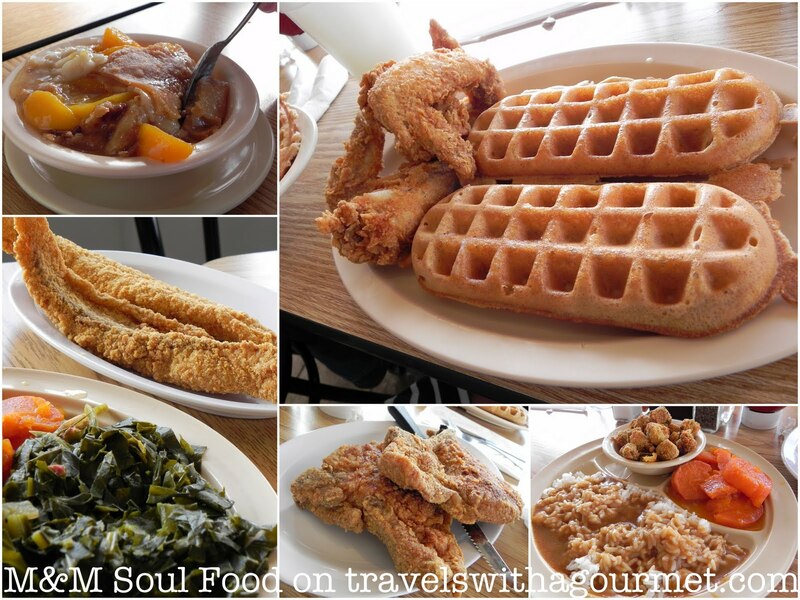 Food at M&M is dubbed Mississippi home-cooking and indeed it is home style soul food – lots of deep-fried items, gravy and typical sides like okra and collard greens. After a quick look, I chose the fried pork chop with three sides – rice and gravy, fried okra and yams. C had the fried catfish with collard greens, yams and fried okra. My sisters both had the waffle and wings (a house specialty) and the kids had the children’s portion of waffle and wings. To drink, we had some muddy water – southern speak for iced tea mixed with lemonade – isn’t that cute? It took awhile for the food to get to us and because the place was busy, and they forgot to give us the complimentary corn bread which they usually serve, but when it did get to us, it was all worth the wait. The chicken wings were crispy and not oily at all – served with the classic waffles which seems like a funny mix but actually works. My pork chop was delicious – batter-covered as well like the wings and crispy and the accompanying side dishes were very, very good. The yams sweetened with some maple syrup, the deep-fried okra crispy and flavorful and the rice and gravy (which my sister ate with her wings) were perfect with the food. I tried a bit of catfish (flaky soft and crunchy at the same time) and a couple of wings as well. A fantastic lunch and the kind of breakfast that would be great after a long night out. I have to say that I’ve never had southern-style cooking before but after M&M, I think I’ll be looking for some soul food the next time I’m in the States.